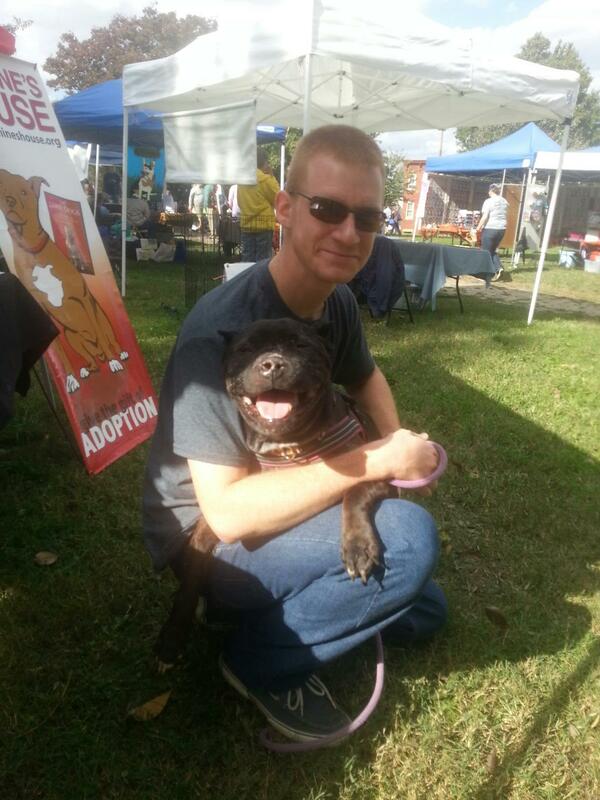 We spent this past weekend at two different dog events helping man the Jasmine’s House booth. Both events were a huge success, but they really got me thinking about dogs in public places. For the most part, everything went great, but at both events there was some barking, some “snarking” (a bark/snarl/snap with no damage), and some really stressed out dogs. 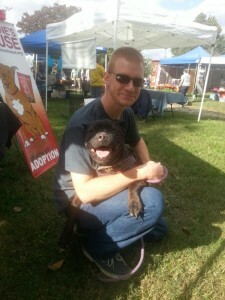 How can you tell if a busy dog event is the right choice for your dog? And once there, how can you set your dog up for success and make sure they have a good time? You probably already know if you have a dog at either extreme. If you have a happy-go-lucky, not a care in the world, loves everything and everybody dog then you already know they love these types of events. And if you have an overly fearful or reactive you don’t even bother. But what about all of us with dogs in the middle? Here are some tips to make sure the experience is positive for both of you. Be honest with yourself. Imagine your dog could talk. If you asked him, “Do you want to go to a busy event with lots of people and other dogs, sounds and smells and distractions?” would he say “Sure!” or “I’d rather stay home and chew my bone.” Make sure you’re respecting your dogs wishes. A busy event is NOT the place to socialize an unsocialized dog! Have an exit plan. Your dog can’t drive the car home himself, so you need to be ready to get out of Dodge if you’re dog is “done” – meaning, stressed and overwhelmed. If you’re going somewhere you know you won’t be able to leave early, you better have a dog you *know* will be ok in public for hours and hours, and give her plenty of opportunities to chill out and get out of the traffic. Pay attention to your dog. There’s a lot to do at these events, and it’s easy to get distracted by shopping or chatting. You need to have your eye on your dog at all times, both for his safety and his comfort. Too many times I see a distracted owner allow their dog to wander over to another dog who really does not want to say hi, and then get themselves snarked at. That is not a positive experience for anyone! Give your dog plenty of breaks. Even if you have a social butterfly, you don’t want them to get so over stimulated and excited that they get themselves in trouble, or can’t listen to you. It’s good to find a quiet place, maybe behind the booths or otherwise out of the way of traffic, where you can go and chill regularly. Bring a peanut butter kong or a bully stick for them to chew, and give them a chance to regroup and destress. Your dog will last much longer! Bring LOTS of high quality treats. You want to be able to reward good behavior, and kibble isn’t going to cut it! Chicken, lunch meat, hot dog, cheese. Remember, the more you reward good behavior, the more you’ll get good behavior! Watch for subtle signs of stress. Just because a dog isn’t barking and reacting, doesn’t mean they are having fun. A surefire sign they are stressed out is if they won’t eat the awesome treats you brought. Also, look at their body language. Is their tail relaxed and wagging (good), or stiff and high or between their legs (bad)? Are their ears alert (good), or pressed against their head? Are their eyes happy and relaxed, or wide and darting around? Mouths are hard – a happy mouth looks like a grin, look at the eyes to help you. An open mouth could also be a stress-pant, in which the lips are pulled back tightly in a grimace, not a grin. Respect the other dogs. Just because your dog may love everyone, doesn’t mean all dogs will love him! There are all types of dogs at these events, and not everyone knows when to get their stressed dog out of danger. Make sure you not only ask if your dog can say hi, but regardless of the answer watch for signs of stressed body language and don’t let your dog greet if either dog is stiff or uncomfortable. Also, keep greetings to 2-3 seconds and move along happily. After a few seconds of sniffing, dogs may either play or fight – neither of which you want to happen on leash at a dog event! By paying attention to your dog, giving them lots of breaks, and setting them up for success, you can have an enjoyable time even with more difficult dogs. But remember – if your dog is a true homebody, let them stay home. No one likes to be forced into doing something they hate! Joanie is a Jasmine’s House foster dog. When we saved her, she had half her face missing from a horrible infection. She is healed and healthy now, and has become quite the local celebrity! Joanie is not comfortable with other dogs in her face (obviously!). By keeping her carefully managed and giving her distance from other dogs, and giving her plenty of breaks behind the booth, she was happy as a clam during the event! 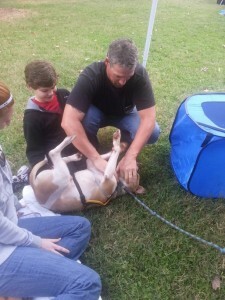 Sinclair, our foster, needs some adjustment time when coming into a crowded event. Unfortunately, when we arrived, we got lost and couldn’t find our booth! Poor boy had to go from a long car ride to walking through the insanely crowded aisles while we searched for where to go. He was a trooper, and although I know he was overwhelmed (his eyes were wide, his body wasn’t relaxed, and he wouldn’t eat treats) he stuck by me and I helped him along by making sure other dogs didn’t get in his face. As soon as we got to our booth, I sat on the ground with him and got him interested in a bully stick. After finishing his chew and chilling out a bit, he was ready to socialize and be a star! I still set him up for success by keeping dog greetings short, and giving him plenty of time behind the booth, out of the traffic. Here he is getting play and belly rubs from some fans! 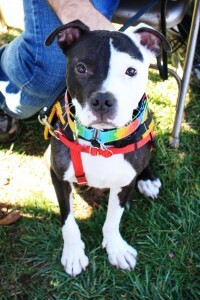 Charlie Chaplin is an easy going, laid back, loves everyone kind of guy. It would have been easy to take him all over the event and not worry about his stress or comfort level. He’s so good, he probably wouldn’t even have misbehaved. But that wouldn’t have been fair to him – remember, dogs can’t decide to take a break themselves, they are attached to us by leashes! We made sure to give him equal time walking around socializing and chilling behind the booth. We kept an eye on his body language, and made sure that he was relaxed and comfortable with every interaction. Do you have tips for keeping your dog happy in crowded events? Do you have success stories or warnings from your own experience? Share them in the comments!